NEW! SEADUCTION COFFEE TABLE BOOK! 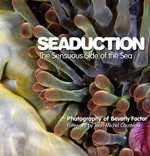 SEADUCTION The Sensuous Side of the Sea,is a stunning collection of photographs that captures the abstract side of sea life which explode with color, texture and usual excitement! There is nothing like it! The images are so otherworldly that they capture one's attention immediately. Nature's complexity is front and center in these incredible images of various underwater creatures that invite multiple viewings and interpretation. Beverly's seductive images portray the ocean's magical world in intimate close-ups, featuring outrageous color combinations, mysterious patterns, textures, and sensual movements. With a foreword by Jean-Michel Cousteau and endorsements by Oceana, Wyland, and Greg MacGillivray of Imax Films, this 176 page 12" x 12" hard cover coffee table book is a must have and will transform the way you look at the world beneath the sea! Visit the Underwater store and order your signed copy today! Angelee Saves the Sea children’s book is the adventure story of Angelee the Angel Fish who saves the sea from pollution and destruction by making a picture book of all the friends she meets on her journey through the sea. Friends she meets, like Tuttie the Turtle, tell her why they are endangered as well. Angelee’s goal is to get her book to the World Leaders on time for their Earth Day TV show so the Land People above will see the beauty of the sea below and the dangers it faces, changing their ways to protect it. However, Angelee’s journey keeps getting delayed by oil spills and other things she runs into. Does she make it? Illustrated with all Beverly Factor’s underwater photography, this 11” x 9” hard cover book contains 40 full color glossy pages of high resolution photographs and includes a glossary of informative fish facts. Endorsed by Jean-Michel Cousteau, Ted Danson, Greg MacGillivray - IMAX Theatre Filmmaker, Wyland and Oceana. Recommended for ages 5-12 or younger. As an extra bonus, request to have your book signed by Beverly! 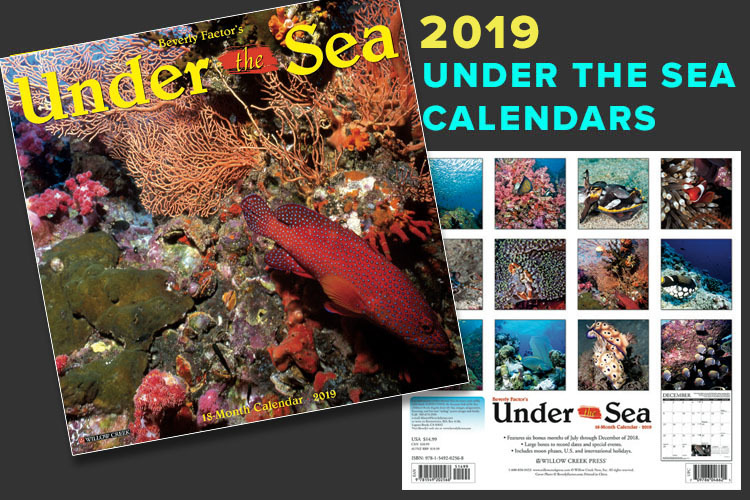 In this 2018 UNDER THE SEA calendar, Beverly Factor presents her most stunning images, offering a unique view of the seldom seen creatures under the sea. The 16-month calendar features 24 full color, beautiful underwater images - each captioned with fascinating and informative facts including dive log notes listing the dive sites and the dive boats. The glossy calendar is 12" x 12" with a full page image each month as well as an inset picture. The UNDER THE SEA calendar appeals to all types of "sea" loving people and fish enthusiasts. It is a great educational tool for children! As an extra bonus, request to have your calendar signed by Beverly! New! Have your very own Wall Mural for any room! Choose from the large selection of images in our Galleries section and we will create a custom wall mural to fit your specific size!. ANY size available! From 4' x 6' and up! Our new affiliate has over 35 years of experience and we're proud they chose to work with us. The murals are produced on a commercial grade vinyl wall covering with a fabric backing. The inks used are fade resistant to 5 years outdoors and 20 years indoors! Tough and made to last. Incredible clarity! You can use it on a whole wall and create an outdoor scene, or even frame it directly on the wall! Applies like a wallpaper! You can do it, or hire a wall paper hanger. Comes with complete directions. Price is determined by size. Cost is $19.95 sq.ft. Please call or e-mail us when you are ready to order, or proceed with the following and we will e-mail you the cost. Shipping costs vary- UPS or FED EX Ground and we will let you know. 2. Choose your size. Determine your desired height and width (min. 4' x 6') Standard sizes are:Sm. 4' x 6; Med. 8'1" x 6'; Lge. 9'5" x 7'; XLge. 10"9" x 8"